Amancio Ortega is one global billionaire whose personality cannot be ignored. Not only is the Spanish billionaire the wealthiest man in his own country, he’s also the richest man in Europe. Any lover of fashion chains such as Zara clothing and accessories would also love the success story of the world’s wealthiest retailer. Here’s how the fashion entrepreneur and the founder/chairman of the Inditex fashion group notoriously known to be a reclusive multi-billionaire went from rags-to-riches. Amancio Ortega Gaona was born on 28 March 1936 in Busdongo de Arbás, Leon in Spain. He is the youngest child of four children born to mother Josefa Gaona Hernández and father Antonio Ortega Rodríguez. His family which depended on his father’s salary as a local railway worker and his mother’s meagre income as a housemaid lived in a very poor condition. Given his parent’s inability to afford life’s essential needs with their meagre salaries, Ortega dropped out of school and began working at the age of 14. He first worked as a shop assistant at a local clothing company, ‘Gala’. Working as a messenger boy in the company was a formative experience for the future billionaire as he learned to make clothes by hands there. In the 1950s, Ortega organized women into sewing cooperatives in Galicia Spain, Galicia, to produce wears such as lingeries, baby clothes, and nightgowns. After ten years of managing the sewing cooperatives, Ortega launched his first company in the market and called it Confecciones GOA, S.A. in 1963. The company sold quilted bathrobes at the time. Ortega is popularly known for his clothing and accessories line Zara which he started in La Coruna with his first wife, Rosalia in 1975. Zara is only a part of Ortega’s Inditex group where he owns no less than 59.29% stakes. Ortega’s retail conglomerate include other luxury fashion chains such as Tempe, Pull & Bear, Massimo Dutti, Kiddy’s Class, Bershka, Stradivarius, Oysho, and Uterqüe. With more than 6000 stores, Ortega has over 92,000 employees. In June 2011, and at the age of 75, Amancio Ortega retired from Inditex and was replaced by Inditex vice-president and CEO Pablo Isla. Amancio, however, continues to play important roles in the business. He remains the main muse and inspiration for the whole corporation. Amancio Ortega has several investments in other sectors including tourism, finance and a lot of gas companies. Again, he has real estate investments in Paris, Lisbon, London and Madrid and owns the tallest building in Spain called ‘Torre Picasso’ located in Madrid. The skyscraper is 515 feet tall and is worth $535 million. He also owns a luxury apartment in Miami, Florida called ‘The Epic Residences & Hotel’. Ortega currently commands Europe’s biggest fortune as one of the richest and most influential men in the world with an estimated net worth of $80 billion. See Also: Bill Gates Daughters, Son, (Children), Father, Height, Religion, Is He Dead? 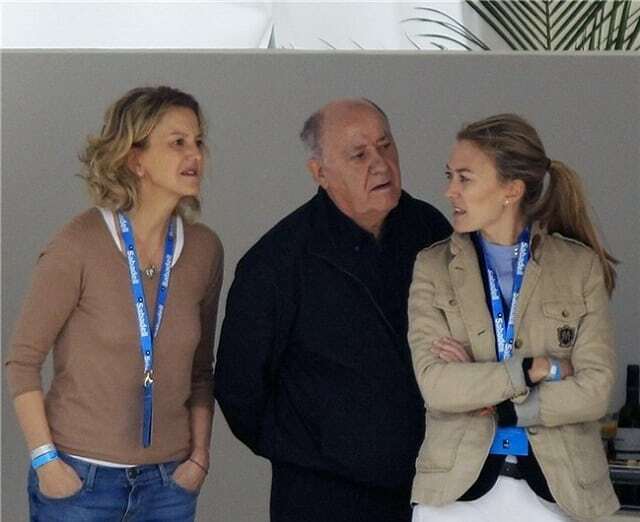 Despite his enormous wealth, Amancio Ortega is on the list of global billionaires who prefer to keep a very low profile and live a modest lifestyle. He is generally known to be publicity discreet and spends millions of dollars to protect his privacy. In fact, no photograph of Ortega had ever been published until 1999. For decades, his lifestyle remained a mystery to the public as the Spanish business leader nor any of his relatives rarely grant public interviews. To show how strictly he guards his privacy, the self-made mogul has only given three interviews in his life and they were only to journalists in Spain. He is mostly seen dressed very simple in a blue blazer, white shirt, grey pants and no tie. His outfits are surprisingly not even from his brand Zara. He drinks coffee daily from the same place and eats alongside the people who work for him in the company café. Amancio Ortega is a dedicated philanthropist who invests in charity. He owns a philanthropic foundation The Paideia Foundation which he started in 1986 together with his first wife. The foundation helps educate and train people who are living with mental and physical disabilities. Also, the Fundacion Amancio Ortega which he established in 2001, is another one of Amancio’s non-profit organizations. The NGO is aimed at promoting science, research, education, social action, culture, and welfare. Amancio Ortega married his first wife Rosalía Mera in 1966 and the couple has two children together, a daughter Sandra Ortega Mera, and a son, Marcos Ortega Mera. However, they divorced in 1986. Many years later, in 2001, Ortega married Flora Perez Marcote. Flora, who is 18 years younger than her billionaire husband used to work at Ortega’s company, and currently, holds a board position at Inditex. Ortega’s second marriage produced a daughter Marta Ortega, who is reportedly considered to be the business mogul’s heir. Marta is very close to her father and shares career similarities with him.